A Place Called Armageddon | AUTHOR. ACTOR. SWORDSMAN. To the Greeks who love it, it is Constantinople. To the Turks who covet it, the Red Apple. Safe behind its magnificent walls, the city was once the heart of the vast Byzantine empire. But a city is more than stone, its fate inseparable from that of its people. 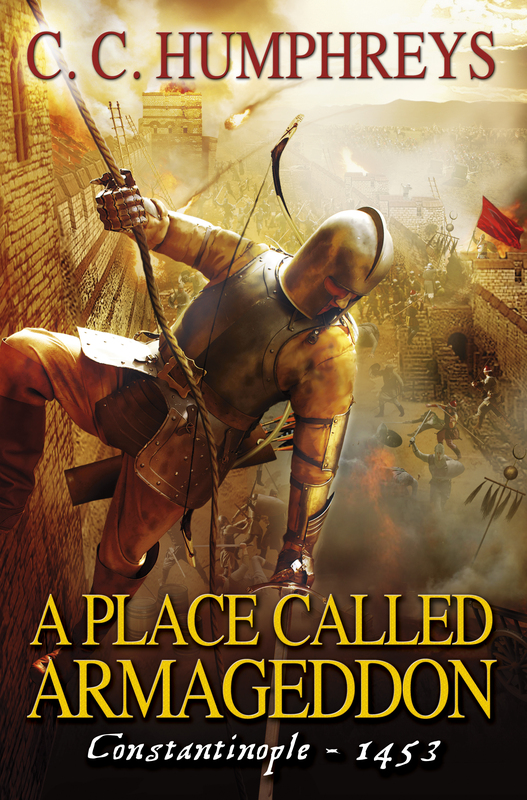 Men like Gregoras, a mercenary and exile, returning to the hated place he once loved. Like his twin and betrayer, the subtle diplomat, Theon. Like Sofia, loved by two brothers but forced to make a desperate choice between them. And Leilah, a powerful mystic and assassin, seeking her own destiny in the flames. This is the tale of one of history’s greatest battles for one of the world’s most extraordinary places. This is the story of people, from peasant to emperor – with the city’s fate, and theirs, undecided… until the moment the Red Apple falls. ‘Just for history and the plot alone, this book is worth reading. Also, a lovely review from the very talented (and obviously perceptive!) Manda Scott on ‘Good Reads’. “Gregoras is the archetypal wounded hero and he comes across as flawed, dangerous and immensely likeable, surrounded by a full, deep supporting cast which is one of this book’s great strengths: nobody is a cipher, no character fails to engage early and completely. In a world where historical novels are so often full of twentyfirst characters in drag, and even those are two dimensional, this book is so full of three-d, real people, it’s impossible not to want both sides to win. In the end, only one can, and it’s heart-breaking, tho’ I suspect it would have been just as bad had it gone the other way. Pingback: Mr Humphreys goes on Virtual Walkabout… in his dressing gown | AUTHOR. ACTOR. SWORDSMAN. Just bought this book two days ago and I’m in the middle of reading it and I absolutely love it! The story is intoxicating and the characters are so great. Finding a really good historical fiction book during this time period is hard. I wish I was reading it right now but Im stuck at work! boo. Great! Thanks so much for this. Hope you enjoy the rest. http://www.ruthkozak.com And have a great time in Istanbul. I love that city! So glad, Ruth. All the best with your book. Are you writing from Turkey? If so you are my first Turkish reader. So glad you liked it. I will be in Istanbul and Ankara in November. Check ‘Appearances’ on my website in next few weeks. Be great to see you there. this is really true. Everywhere I read this book. through the course of the bus before class… many of my friends who wants to read the book. I will definitely check their ‘Appearances’ in, and I’ll be there. see u there… inşallah. I have read recently Armageddon. It was not only a breathless reading of a lover of historic novels. But it was also of a ex sailor who has dared to start writing. So I also read your advices carefully. I’m sure they will help me much. I’m not in a position at all to criticize a novel,especially one of Bestsellers. Tidal movements (currents, foolds and ebbs) in the coastal waters of any Ocean is part of daily life. However the people in the Mediterranean, particularly those in the eastern half are unaware of them. İf the water level rise two feet then the people run away from seaside in belief of an approaching catastrophy :). Water level may rarely change in Adriatic. But here in Istanbul it change only because of strong winds which is not considerable for navigation at all. As you probably know, there is a strong southerly current in Bosphorus. But it is a result of the overspilling waters of Black Sea to the Med. So,a sailboat can never keep it’s position without anchor or mooring even in a zero weather condition. I don’t know how many more Turkish sailors will read your books. (I wish many, many). But you may consider to correct the relevant parts in the new edition(s). You’ll be asked only to sign my copy of P.C. Armageddon in exchange. I will try to be there at the book fair. Ramos I’d love to visit your amazing city. I promise more interesting places to see than ordinary city tours. Just finished Vlad. Loved it more!! Thank you for a truly great read. Cheers, Mark. So pleased you are enjoying my novels. Excellent! Let me know what you think! Love the book! Just one problem, the Byzantines never considered themselves “greek” they still referred to themselves as Romans. Thanks, Joe. So glad you liked it. As to ‘Greeks’ and ‘Romans’, I am sure you appreciate I did a fair bit of research for the novel! Earlier indeed the Byzantines referred to themselves as Romans. By this time, though they considered themselves the heirs of the Roman Empire, they referred to themselves, and their enemies called them, Greeks. Its in all the contemporary reports, European and Turkish. Hey Chris, I am enjoying your book. I do have a question however. In Chapter 9 you refer to Leilah having charts which show a conjunction of Venus and Neptune. Are these supposed to be astrological charts showing the planets Neptune and Venus? If so, it would be impossible since Neptune wasn’t discovered until 1846 and so was not included in astrology practiced in the 15th century. I thought I’d try to bluff it out… But no, I just got it wrong. Durn Stars! Excellent, Charlie. Please do. Ignore the astrology. I am haftway in the book now.. and I find already exciting….. Excellent! Let me know what you think at the end. What language are you reading it in? English Sir. I’m from the Philippines and we have english as a primary medium of instruction. I love your presentations of the ethos of Constantine XI and Mehmet Fetih. Its very immersive. Thanks. Good to know I have readers in the Philippines. What a magnificent book, thoroughly enjoyed reading this superb work, many congratulations Chris. It’s also great for somebody to write about other periods in history, I mean how many novels are based in either Roman or Napoleonic times? Both this and the Jack Absolute series are about periods that no other author has tried. Thanks for that, a bit a variety is never a bad thing. Thanks, Phil. I never really considered that I write outside the normal spheres. Its whatever story grabs me, I suppose. Pingback: Armageddon In Greece: My novel in the birthplace of literature | AUTHOR. ACTOR. SWORDSMAN. I have already read the book twice, and I can’t get enough of it! I have to say, my favorite character has to be Gregoras Lascaris. I love the way he is described, and not only him but Constantinople as well. After reading this book, I would love to see the magnificent walls for myself! Not only that, but I would like to work on finding out what actually happened to Constantine (I’m not about to go looking under Constantinople in search for him, though; that would be silly for a 13-year-old to do). It seems strange that he disappeared so suddenly. Constantine and Mehmet are tied as my second-favorite characters; their leadership and courage are my inspiration. The discription of their exhaustion during the seige were great additions to the storyline. I also loved the fact that you used the Greek and Turkish terms instead of translating them; it made me feel like I was actually in the story. Achmed was another favorite of mine; it was so heart-warming to read that he found a home for little Minerva. His courage was also a great motivational pathway for me. I enjoyed reading this action-pack novel, and hope to read further into your writings. Oh, Kaylie, this was great to read. Thank you so much. I love it when people get so into a book and its characters. Be great to start an expedition for Constantine’s bones! I’m in! I am fellow Canadian, just like you. I am from Toronto, ON. I was looking for an ebook. Understand my surprise (to say the least!) when they said it is only available in US!!! Is there any way to buy the ebook in Canada. Thanks, Pavel. I’ve sent you an email!